What an absolute shamble ! If Pellegrini does not get his act together fast ,we will be relegated ,which would be absolutely disastrous for the Club. Four defeats from four, with Everton ,Chelsea and Manchester United to come means we face a very realistic scenario of losing seven matches from seven. I have heard all sorts of reasons why we are in such a predicament .Many have pointed the finger at The Board ,saying we are paying the price for years of lack of investment. True .But as fans we can’t change the past ,but we can help shape the future .Others blame the Stadium, saying our fortunes will never improve whilst we are we are based at the London Stadium .No denying to date the move most certainly has not been a success, but it is a cop out to blame everything that’s wrong at The Club on The London Stadium .Let’s try to separate fact from fiction here .Some time back David Sullivan ,promised us a top class manager ,stating they would back him to the hilt . He also said that all players signed ,would be with the manager’s approval ,and the manager having seen the players play .Sullivan also said that he would be taking a back stage with transfers, and we would have a “global ” scouting team .I’m afraid Sullivan was being economical with the truth. Far from not spending in the January transfer window, as to save the transfer funds for Pellegrini as some have suggested, although they clearly had talks with Pellegrini .I believe that they fully intended to appoint David Moyes as manager But that went belly up , when the Scot demanded full running of the football side of the Club, and total control of transfers .Sullivan was not going to have that in a million years .It was then that The Board went all out to land Manuel Pellegrini, who has a huge reputation of being a top manager and for playing attractive football. The Board and the fans were delighted including Fareham .Pellegrini, was heavily backed no question about that .Of course the ‘global ‘ scouting network is just a fugitive of Sullivan’s imagination .As for the signings some have been Sullivan’s ,some Pellegrini’s .Fredericks ,Diop ,Wilshere and Fabianski are Board signings. Yarmelenko ,Anderson, Balbuena ,Perez are Pellegrini signings .Yet some would have you believe, that Pellegrini scouted the likes of Fredericks from China .ABSOLUTE B*LL*CKS ! Regardless who brought the players in, Pellegrini ,has claimed they were his signings so he must carry the can for the flops. At the end of the window having spent close on 100 million, the general verdict was that it had been a very good window . I still believe we have a good squad capable of hurting most teams .The signing of Felipe Anderson is a massive signing. Providing he is used as an attacking midfielder and given a free role , he will be hugely influential in the West Ham team. But why the shambles ? I lay the blame at the feet of Manuel Pellegrini. For a man who claims to have watched every one of our games last season, (porkies!) he would have seen that our midfield has been woeful .Not just last season, but for a number of years as far as our midfield goes it has always been the same. No pace ,movement, creativity, goal threat .Slow laboured passes ,sideways ,backwards ,anything but forward. When closed down quickly by the opposition, the ball at best is shovelled back to a under pressure defence .When we venture forward we run out of idea’s ,we get dispossessed and the opposition have a free run at our goal. Bringing all the new signings in and not bringing in a top defensive midfielder as well as a creative midfielder ,is equivalent to a motor car manufacturer assembling a motor car and doing a fantastic job then forgetting to put the engine in .Well the midfield is any football team’s engine, the state of our midfield, is the biggest reason why we have performed so poorly. Some will point out that we did bring in Jack Wilshere ,Wilshere in my opinion was always going to be nothing more than a bonus at best. He was dropped by Eddie Howe at Bournemouth whilst on loan ,Bournemouth season ticket holders will tell you he was mediocre at best ,a shadow of the player he once was .It has been the same story at ours. Small pockets of skill but few and far between ,so slow !It MUST have been obvious to Pellegrini during preseason, that Noble and Wilshere were like a pair of tortoises together. They made Ipswich Town look like Barcelona for God’s sake ! Even after spending £100 million, Pellegrini could have brought in another couple of midfielders on loan. Unfortunately, he knocked back that idea, because he didn’t want to sign players on loan. Opting to sign Sanchez on a two-year deal paying him 80 grand per week and signing Perez for 5.5 million and giving him a three-year deal at 100 000 per week. It must have raised eyebrows in the Boardroom ,but it was the manager’s decision at the end of the day. Still a baffling decision by the manager ,by no means the only one from Pellegrini. “In Pelle we trust ?” At the moment I most certainly don’t !He has resembled an ageing boxer in the twilight of his career ,a shadow of his former self ,at best ring rusty. We better hope he is ring rusty and not the former ! With every match that goes by ,I’m reminded of Avram Grant .Clueless !Outdated !Players don’t know what they are supposed to be doing, drained of confidence. He doesn’t know his best team after TWO months apparently. You are in the team one minute then not even in the squad the next .A fantastic way to deal with a young talent like Declan Rice ,pull him off at half time then banish him from the squad the next minute. He is by no means the only player to have suffered that fate. It has been like a game of musical chairs !You’re in then out ,shake it all about. That’s how players lose confidence and respect for the manager .I have noticed a change of attitude regards Marko Arnautovic this season .At times he looks as though he can’t be bothered and is selfish .At times Anderson, has looked to play a quick one two with Arnautovic, and it has not come off simply because Arnautovic has been too greedy. I did not like the idea of him taking the penalty against Bournemouth , when Mark Noble, the Club Captain and regular penalty taker was on the pitch. It has been spun that it was to give “Arnie ‘confidence’ and help be top goal scorer “What a load of crap !It’s not about Arnie !It’s about West Ham United !It is wrong message to send to the rest of the squad and Arnautovic. Deep down I wonder what Noble thought or felt at that time, it is a perfect way to diminish the authority of the Club Captain .Ridiculous . 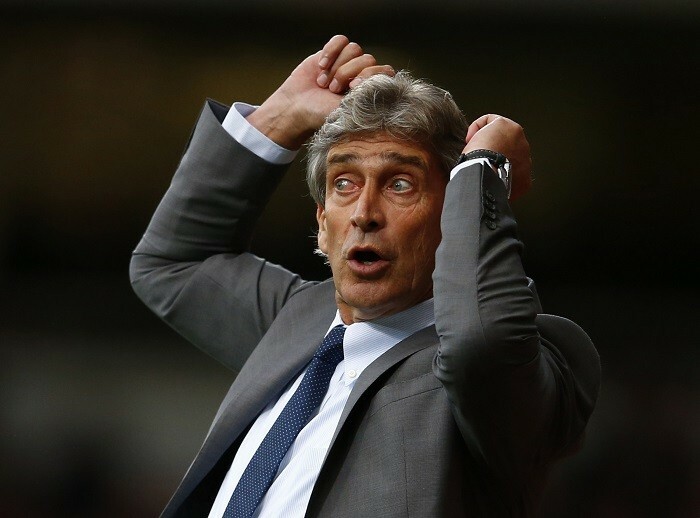 A whole host of problems ,Pellegrini has got to lift himself off the canvas and box smart. He most certainly can do that, more importantly has the experience to do so .But he is going to have to adopt a realistic approach to cure our ills. Forget the highline ,Pellegrini is living in fantasy land if he thinks we have the midfielders to stroke the ball around in midfield .We haven’t .He needs to make the midfield compact and give it legs and give Anderson a free role in it. I’m going with : Fabiankski in goal .Then :Fredericks ,Diop,Balbuena,Masuaku (I did consider putting Ogbonna at left back ),Sanchez and Noble both holding, Anderson and Obiang ,with Arnautovic and Yarmolenko up front .A compact midfield ,Obiang being the legs, dropping back when required ,Anderson having a free role, being able to use his pace like against Arsenal. With Anderson carrying the ball forward at pace space will open up, allowing Noble the time to switch the direction of attacks .It requires discipline from Noble in particular. He hasn’t got the pace to charge up and down the pitch. I’ve never been a Noble fan, but we simply have no option. No free passes but we are like a rudderless ship at the moment, his leadership is needed. Yes, it is a patched-up midfield with limitations , but it gives us a fighting chance .Football like life is a game of inches ,you win or lose by an inch. That is the territory we are now. Cast your mind back to our match against Blackburn 2007 the Great Escape. We were bottom, Zamora’s shot hits Tevez, who was in an offside position, but doesn’t cross the line. Tevez run’s away to celebrate ,the ref gives the goal we win. We win seven of our next nine games and stay up. Guess what ?We have a squad that is more than capable of doing the same. Even a point against Everton would be a tremendous boost. Yes, Chelsea is tough, but I’m really looking forward to Manchester United. I would love The General to score and give us a salute !The London Stadium would be on fire !Times are tough, and results have been disappointing, prove me wrong Pellegrini !Lead us to the promised land. Let’s get to Wembley and win the FA Cup. A day we will never forget. It is not about Gold and Sullivan, The London Stadium ,Pellegrini or indeed the players. It is about West Ham ,we are West Ham. We are more than a football Club, we’re a way of life !COYI’S!! !